Narges Mohammadi (b. 21 April, 1972) is the vice-president of the Defenders of Human Rights Center in Iran. Though educated a physicist, she is best known for her activities as a journalist and for her militancy within human rights. Writing and acting on the fields of human rights, women’s rights and campaigning against the death penalty, her efforts have been recognized internationally, and Mohammadi has received the Italian Alexander Langer Award, the Swedish Per Anger Prize and the Human Rights Award of the German city of Weimar. 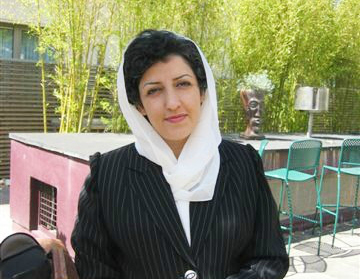 As a student of physics at the Imam Khomeini University in Qazvin in the 90s, Narges Mohammadi was engaged in the student political life and participated actively in several student movements. She was one of the founders of a student organization called Tashakkol Daaneshjooei Roshangaraan (Organization for Enlightning Students). It was during her student years that Mohammadi first became acquainted with repression: first she was banned from practicing her hobby, mountain climbing. Later she was arrested twice for working on reformist Mohammad Khatami election campaign in 1997. Mohammadi wrote for several reformists magazines and newspapers, all of which were closed by the judiciary. The periodical Payaam-e Hajar was particularly important, as it was a well-known publication specially on the field of women’s rights. In 1999 she married Taghi Rahmani, a pro-reform journalist who was arrested shortly after their marriage. They have twin children, Ali and Kiana. In 2003 she joined the Defenders of Human Rights Center founded by the Nobel laureate Shirin Ebadi. There she helped documenting human rights violations, she campaigned against the death penalty, as well as helped activists, political prisoners and their families. In 2008 she became the president of the executive committee of the National Council of Peace in Iran, an umbrella group that promotes human rights. The Iranian authorities ordered Narges to stop her work as a human rights activist and banned her from leaving Iran in 2009. She did not comply with the order, and her bravery costed her freedom: she was arrested and placed in solitary confinement. She was sentenced to 11 years in prison for being a threat to national security. While in prison, Amnesty International named her one of the 12 most important figures in human rights. Mohammadi was released in 2012 on account of medical reasons as she had developed partial muscular paralysis, a neurological condition. It was also in 2012 that her husband left for France as the climate towards human rights activists became more and more hostile. Narges, however, has always refused to leave the country, claiming that she would do a better job defending human rights for Iran in Iran. In 2015 Narges would be arrested again, this time on charges of “cooperating with ISIS”, “spreading propaganda against the state”, “committing crimes against national security”, and belonging to an illegal organization, the group Legam, a human rights movement that campaigns for the abolition of the death penalty. In 2016 she was found guilty and received a 16-year imprisonment sentence. Not only did she lose her freedom, she was also denied health care and access to her family. She initiated a hunger strike in order to be able to speak through the phone to her children, who live with their father in France. As a result, she was granted a weekly phone call. Narges impressive bravery and wish to carry her activities despite years of persecution may puzzle those who know her story. In a letter from April 2017 Narges Mohammadi herself explains why and how she keeps fighting: “People with common sense and those lusting for power think that prisons are places where inmates go through pain and suffering to repent and return to society. They don’t realize that when pain is inflicted by taking away the freedom of an idealist, it makes her more determined”.